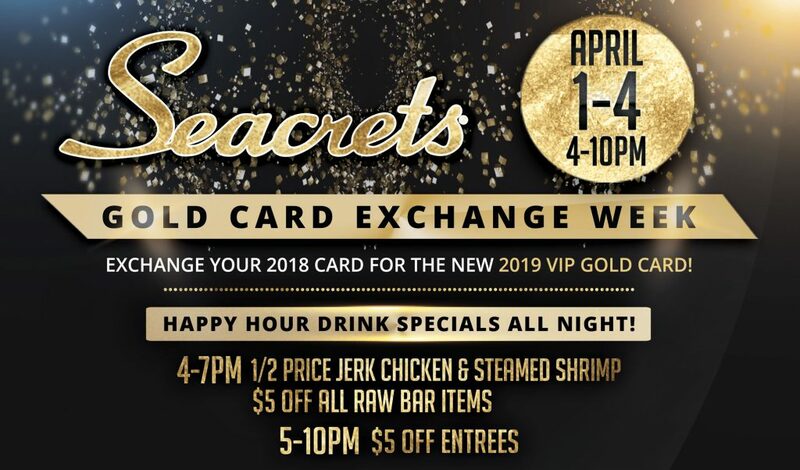 2019 Seacrets Gold Card Exchange Week! Mark your calendars, It’s time for your new 2019 Seacrets Gold Card! Come in April 1st -4th from 4-10PM and exchange your 2018 Card for the BRAND NEW 2019 Gold Card! PLEASE BRING VALID ID AND 2018 CARD FOR EXCHANGE. Happy Hour Liquor Specials all night including $5.50 Seacrets Spirits/ Crushes as well as $6.50 Rum Runners, Pina, Pains, Frozen Orange Crushes and Electric Lemonades!